In the 1970s, armwrestling really began to pick up steam with dozens of organizations forming and thousands of male competitors entering the sport. But it took a few years for women’s divisions to catch on. 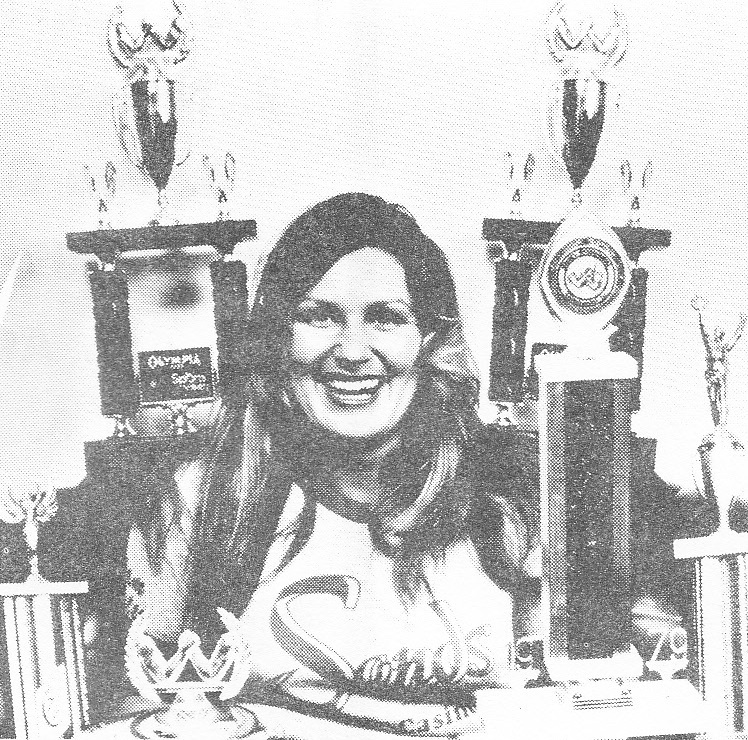 During the first half of the ‘70s, only a few organizations featured a class for women, and those that did offered a single open weight class. By 1976, both of the top professional organizations (those that gave the biggest prize money) started featuring two classes: a lightweight class and an open, or unlimited, class. This helped attract more women to the sport. Who were the top female pullers of the decade? I did some research to try to find out. To develop this list, I focussed mostly on results from the major events of the era (that obviously featured women’s divisions). These were the biggest tournaments, which attracted the best pullers. They include national and world championships organized by the World’s Wristwrestling Championship (WWC), the World Professional Armwrestling Association (WPAA), the World Arm Wrestling Federation (WAWF), the American Armwrestling Association (AAA), and the National Arm Wrestling Association (NAWA). Based on my analysis of the results I’ve managed to find, in my opinion, these are the top 5 female armwrestlers/wristwrestlers of the 1970s. A student from Lancaster, California, Vicky Vodon won the women’s division at the inaugural WPAA U.S. Pro Armwrestling Championships in 1974, where she downed the arm of Donna Myers, the reigning World Wristwrestling Champion. 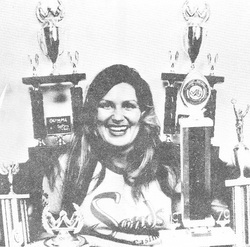 She added two major titles in 1975, winning the WWC Nationals (again over Donna) and the WPAA U.S. Pro title for the second year in a row. Cel Rutledge, a 32-year old lab technician and shot-putter from Concord, California, is only known to have competed in a single event. But it was a big one: the 1975 World’s Wristwrestling Championship. The women’s division included four former world champions, and she won the class with relative ease (with Vicky Vodon being the only puller to put much of a fight). Cel was considerably bigger than her competitors, and her win prompted the heads of the WWC to add second class to the women’s division in 1976 to keep things fair. Just how strong was Cel? It’s impossible to know, but the fact that she finished at the top of a class that featured virtually all of the top female competitors of the early ‘70s warrants her inclusion on this list. Bristol, Connecticut’s Cindy Baker, daughter of legendary puller Maurice “Moe” Baker, achieved success of her own at the armwrestling table. Her first major title was the WAWF world title, which she won in May 1977 at just 16 years of age. Four months later, she added a WPAA U.S. Pro title to her résumé, defeating Mildred Choplick. 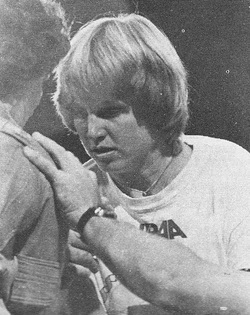 She capped off the decade by winning the AAA Sit-Down Nationals in 1979, defeating Rocky O’Shaughnessy, the reigning AAA heavyweight champion. Between 1976 and 1978, there’s little doubt that the top active female armwrestler was Mildred Choplick, a 6-foot tall weaver from Fairfax, Iowa. She won two WWC national titles, three WWC world titles, and the WPAA U.S. Pro/World Championships in two out of three outings. 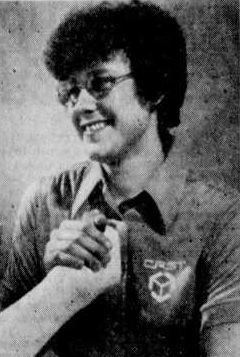 Pam Carter entered her first tournament in 1976 and won. In her second contest, she defeated Deborah Lyle, the reigning lightweight world wristwrestling champion. 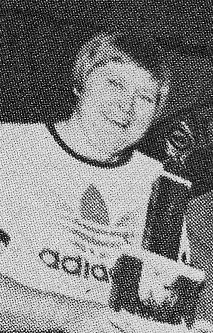 However she only started taking the sport seriously in 1979 hitting most of the top tournaments on the west coast. That summer, Pam won the NAWA World title. In October she then attended the World’s Wristwrestling Championship where she defeated Mildred Choplick in the finals in less than four seconds. Four weeks after that, she travelled to Wetaskiwin, Alberta, to win the WAWF World Armwrestling Championship. Judging by the way she soundly defeated the top competitors at the end of the decade and by the number of major titles she accumulated in rapid succession, I feel she was the top female puller of the ‘70s.